This past weekend, I was in Cooperstown, New York for the Major League Baseball Hall of Fame Induction Ceremony. This was my first time to this hallowed ground. Myself and some 50,000 other pilgrims made the journey (including many folks from as far away as the Dominican Republic) to this small town of 1,822 people to witness John Smoltz, Craig Biggio, Randy Johnson, and Pedro Martinez’s induction into the Hall. How could this town of 1,822 handle an increase of 2,644.2% for the weekend? It was not by central planning, but by market forces. Throughout the town, people were selling parking spots on their lawn. Some were selling all-day parking for $20, others for $40 (but $20 seemed to be the norm). Local businesses did the same, renting out spots in their lots. All along the streets of the tiny village, kids and adults were selling bottles of water, cookies, brownies, lemonade, and other goodies to the hungry and thirsty tourists. The whole town pitched in to help feed and comfort the deluge of visitors. It was as if guided by some invisible hand, these individuals expanded the supply of the town in order to meet the demand of the tourists. It was truly a sight to behold. An economic crisis faces New Hampshire. Throughout our state, workers are facing pressure from out-of-towners. These out-of-towners are coming in from the suburbs and outlying towns to Manchester, Salem, Concord, and other population centers and taking jobs from the local population. Senators, this issue is not just in our state, but throughout the United States. I insist you introduce legislation that bans companies from hiring out-of-towners; Manchester firms must hire Manchester citizens. Concord firms must hire Concord citizens. Salem firms must hire Salem citizens. This will keep jobs and money in our local communities instead of people coming from other places, using all the city’s resources, and then take their income away. Out-of-towners are a burden on our communities and it needs to stop. One of the teachings of economics is that humans are, generally, self-interested. Critics of economics have seized upon this terminology to argue that economics (and free markets in general) are promoting selfishness. It’s the whole “greed is good” mentality. Nothing could be further from the truth as there is a distinct separation between selfishness and self-interest. Selfishness is marked by a lack of consideration for others; the self is supreme. Self-interest is looking for the best ways to promote’s one welfare, how to make one happy. This includes caring for others. I have a family whom I love. I have friends whom I love. To the extent I can, I try to be generous with them: buy presents, spend time, that sort of thing. This is self-interested behavior perfectly consistent with economic theory. Taking care of my family and friends makes me happy, plus provides a safety blanket. It also fills social needs and desires. This is just one example of self-interest, but there are many more: charity, friendship, neighborly love (perhaps, one might say, the Christian Virtues). So many of the moral criticisms of economics and markets stem from confusion over these two terms. Perhaps I shall write more on this topic in the future. Nature is ruled by evolution. New challenges arise, so the flora and fauna adjust or perish. This order, spontaneous as it were, is determined by animal actions, but not animal designs. It is the same with economics and society. Markets and society are determined by human actions, but are not designed by humans (to paraphrase Adam Ferguson). The result we see around us is spontaneous and evolutionary. Yes, humans innovate. Yes, humans act. But we all act in regard to our own self-interest (which is not to say acting selfishly, but that is a post for another time). We are not following some Great Plan. Virtually all attempts to plan markets, to plan society, on a large scale have failed miserably: the USSR, Venezuela, Mao’s China, just to name a few. The results are disgusting poverty, violence, and chronic shortages of both peace and love. These things are necessary, mind you, to direct society in the manner of some Great Plan. The reason why is simple: humans have this pesky thing called “free will.” We are not robots to be programmed. We are not unthinking drones, awaiting some master to direct us. We are all individuals with hopes and dreams, needs and desires. That is why violence is necessary in a planned society: some will not want to go along with the plan. Since markets and trade abhor violence, their evolutionary process is peaceful. Societal evolution can either take place through violence by some person hammering his/her version of perfection onto everyone, or it can come about peacefully through the individual actions of billions of people. I contend no civilized society can be built upon violence, and therefore only the second option is available. Greece became the first industrialized nation to default on its debt to the IMF on June 30. Greece’s long journey to default over the past five years has spurred lots of conversations and debates and lessons. There is far too much to cover in this blog so I want to focus on one that has personal, as well as international, implications. There is a simple, common-sense lesson to be learned from Greece: You can live on debt for only so long as someone is willing to lend to you. Greece’s debt (as a ratio to its GDP) is high. Japan’s debt is higher, however. So why is Greece facing default and Japan isn’t? Lenders were concerned Greece wouldn’t be able to pay its bills in the future, and thus stopped loaning them funds. Japan doesn’t face that issue (yet). The same is true with the US. The US has a debt-to-GDP ratio of around 1. Spain’s is lower, approximately .75. Yet, Spain is facing a crisis similar to Greece (albeit not nearly as bad). Similar to Greece, investors are concerned about the country’s ability to repay debts and have scaled back their lending. This is not true in the US. In theory, any country could deficit-spend its way through life into perpetuity, so long as someone is willing to lend. But if something happens and that credit stream dries up, then it presents big, and painful, issues. Margaret Thatcher once famously said that the problem with socialism is you eventually run out of other people’s money. As the USSR, Venezuela, and Argentina found out, that is very true. But the same can be said of deficit spending in general: the problem with deficits is you eventually run out of other people’s money. This is why I believe in markets. 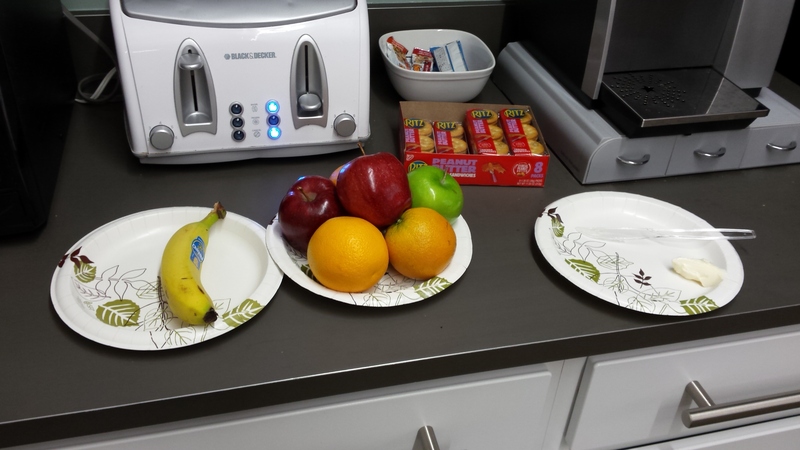 The above is a picture of some of the breakfast treats my company has supplied this week. Bananas, apples, oranges. All kinds of exotic goodies. “But Jon, you sly and handsome devil,” you cry, “None of these things are exotic. They are quite commonplace!” This is correct, and exactly my point. With the exception of apples, none of these items are native to New Hampshire. And yet, they are freely available. With no one guiding them, people from all over the country (and possibly the word), provided the seeds, land, labor, fertilizer, equipment, transportation, etc to bring those exotic fruits to my plate. The kings of England and emperors of Rome never had it so good! 4% growth. That’d be quite the feat. Boom-times growth. To do this, he rightly reckons, workers would need to increase their productivity (after all, a worker is paid by his productivity). But he wants to go about it in a rather poor manner: increase hours worked. That would increase productivity to some extent (a man who works 8 hours is generally more productive than one who works 1 hour), but after a given time, there is decreasing marginal returns (for each unit inputted, the worker would become marginally less productive). So, increasing hours worked would only be helpful to a certain extent. Where the focus should be is increased capitalization. Labor and capital are compliments, rather than competitors. A worker is more productive (and thus earns more income) with more capital, and capital is just lumps of junk without labor. Economies that are labor-intensive (China, Southeast Asia, Africa) tend to be poorer, whereas countries that are capital-intensive (US, Europe), tend to be wealthier. If Jeb really wants to achieve 4% growth, he’d focus on sustainably increasing productivity.